It’s an illustration of the vacuousness of the vast climate industry that one rather silly and misleading graphic has caused such a frenzy in their community over the last couple of days. Climate scientist Ed Hawkins from the University of Reading put this animated gif on his Climate Lab Book blog on May 9th and promoted it on twitter, and since then it has ‘gone viral’. Climate hysteria seems to be spiralling out of control. This “Doom Spiral” Is All You Need to Understand Global Warming: Global temperatures are spiraling out of control, and this spiral animation proves it. The spiralling climate crisis GIF every business leader should see: But “terrifying” doesn’t even cover it. As you watch the accelerating outward spiral of the post-industrial revolution temperature record the true scale of the environmental challenge hits home like a freight train, like a forest fire, like a cleaving glacier. Can a GIF change the way we think about global warming? : Mesmeric yet terrifying, given its implications, the GIF will continue to make waves on the internet for a while yet. But will it change policy? Are temperatures "spiralling out of control"? No. Humans are largely responsible for past warming so we have control over what happens next. Other climate scientists praised the diagram as an example of excellent science communication.
. @ed_hawkins Viewer falsely interprets changes as percentage distance from centre. Only correct if ratio-scaled. Temperature is not. @OldStatProf perhaps @ed_hawkins should replot it in Kelvin? Tags: hype, science. Bookmark the permalink. Just how do you compete with this kind of thing? Plain old science isn’t enough to counteract this nonsense. Traditionalists might prefer a graph, but this GIF moves and is perfect for the internet age. All it lacks is kittens. A lot of viewers of the graphic seem to be having kittens. “Warning. This post contains material that some readers may find terrifying”? I like Svein T veitdal’s description of a ‘166-year animation’. Given it often takes three or four days just to make a 30 second animation, I’d guess 166-year animations take 956160 years to complete. About the same length of time it takes me to complete a post on Cliscep. Warning! Hypnotic imagery. Focused attention may induce belief in CAGW. Please stop tweeting about how climate change sank five islands in the Solomons. It’s bad journalism. 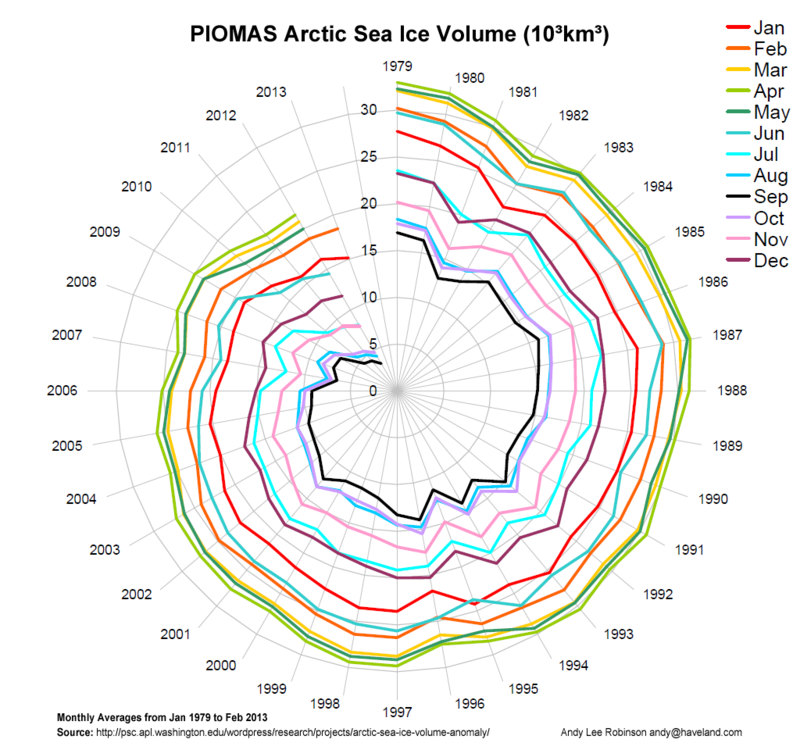 Polar plots with selected scales are a bit naughty. 9 out of 10 kittens prefer Hawkins’ Doom Spiral compared to regular temp graphs. Clive Best – they are indeed a bit naughty. Radial scale goes from a chosen zero to a chosen upper limit which maximises the visual impact – a big sense of some 100% out there to be approached. A visual impact complicated (some might say deceived) by the increasing area enclosed by spiral as it goes round and outwards, yet presumably the radial distance is the measure being used. Hard to say if this is yet more turpitude. Or stupitude. Or innumeratude. Or astatisticismatude. Or just some dude having a laugh at almost everyone else’s expense. Can you slow down a GIF? I think if you did, you would see that the spiral does not build uniformly (it expands and contracts) and the ‘out of control’ loose thread at the end is not a good guide to future growth. if you run it backwards we go down the drain. Or vanish up our own base line. The #1 problem with the doomy graph is that it cannot prove anthropogenic causation, just warming. And that is what the debate is about, causation. In fact, if it’s a spiral and it has to do with climate change, it’s virtually certain that the cause is anthropogenic; because, as we all know, Nature doesn’t do spirals – well, at least, not Death or Doom ones. If cold was on the outside and warmth on the inside, the animation would look much the same. It grew inward and outward because the most obvious changes are new temperature records. When you start at a year and move forward, you get a lot of new records both hot and cold. Someone adept with gif’s should make one in kelvin, although watching a dot go around in a circle might be boring. Of course both Gif’s could be displayed on tablets fastened side by side with brads. They could be the keys to understanding how hyped it is. You sceptics are real meanies, not letting Ed’s scary chart last a week before de scary-fying it. I live in a rural area and farmers are always looking for new and inventive ways to scare pigeons of their crops. Ed’s spirograph looks like it could be perfect for the job. Ed could become a self-made millionaire if he gets in quick and patents his design.